China, Algeria celebrate 60 years of diplomatic relations, 64th anniv. of Algerian Revolution - The Maghreb Times ! 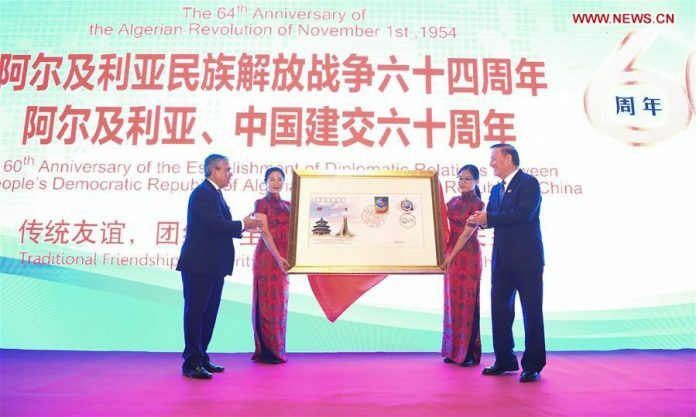 Arken Imirbaki (R), vice chairperson of the Standing Committee of the National People’s Congress (NPC), attends a reception held by the Algerian Embassy in Beijing to celebrate the 64th anniversary of the Algerian Revolution of November 1st, 1954 and the 60th anniversary of the establishment of diplomatic relations between China and Algeria, in Beijing, capital of China, on Nov. 1, 2018.